» Dual Cleopatra isn't trash, just niche! It's been a while since I made a post like this and I've seen a lot of negativity towards Cleopatra so I decided to make this thread. I admit I wasn't to thrilled when she was announced but after trying a few different team builds with her i think I found her niche so let's get to it. Disclaimer: I'm doing this with my phone so it's probably wrong look to pretty, I'm planning to add images and all that this weekend. Also it won't probably be too extensive until the weekend where I will have more time. 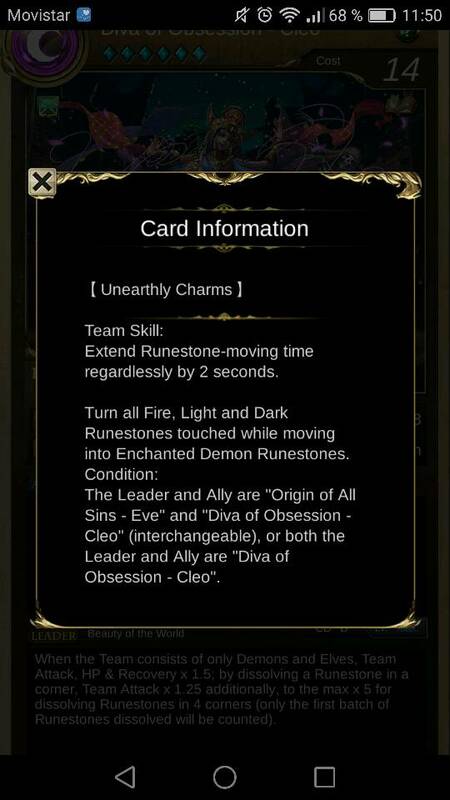 Note: The leader skill works when using only demons. So we are working with a 2.25x hp, attack and recovery with a conditional extra attack multiplier of 1.25 from each leader for each corner which means 25x for the four corners giving a maximum multiplier from the leader skills of 56.25x not too impressive but there's more. The active makes it a good 112.5x at CD 6 with two columns (of your choice, can double tap one to only make one column) of enchanted dark demon runes which is a big boost to dark demons. So now onto the defensive part, with 2.25x to hp a 9k hp team becomes a 20k one and with the easy to trigger 60% shield the team can tank 33k hits which is excellent for a demon and elves team with their low hp. For normal hits because of the shield it's ready to recover. Dual Cleopatra team isn't a damage every turn team it's more like a grind team, easily survive the enemy attacks until you are ready to burst and kill the enemy. A key point of that strategy is the excellent damage control presented by just not dissolving the corners with that you can dissolve runes without fear of doing too many combos or skydrops doing too much damage when you aren't ready and because you can do combos healing isn't hard. Now with all that it's a good but you may want more hp, easy! Just add rider Knapp or Samle to go from 20k to 30k or 40k respectively or add both for a ridiculous 50k hp that with the shield the team can tank hits of 50k, 66k and 83 respectively. I recommend Knapp over Samle because Samle requires only demons and that blocks some great utility elves and Knapp active is a nice heal. If going mono demon Theressia it's a great option more damage and extra healing! Other great members include Li Ji (new water elf) for two turns of rune moving time time tunnel (7 seconds most of the time) and 2x for demon and elves; Daji for time tunnel booster and extra spin time with dragon ware, pr Yog although she needs fire runes on the board to work, Sandman for recovery and stalling, Neferpitou for the turns of healing and a nice time tunnel+ damage boost, Lancelot self boost is easy to keep up and the conversion pairs nicely for a second turn off a lot of dark runes. The pitfalls of the team are the typical ignore damage reduction and willpower but also dual tornado destroys the team because you can't dissolve the corners fit full multiplier. 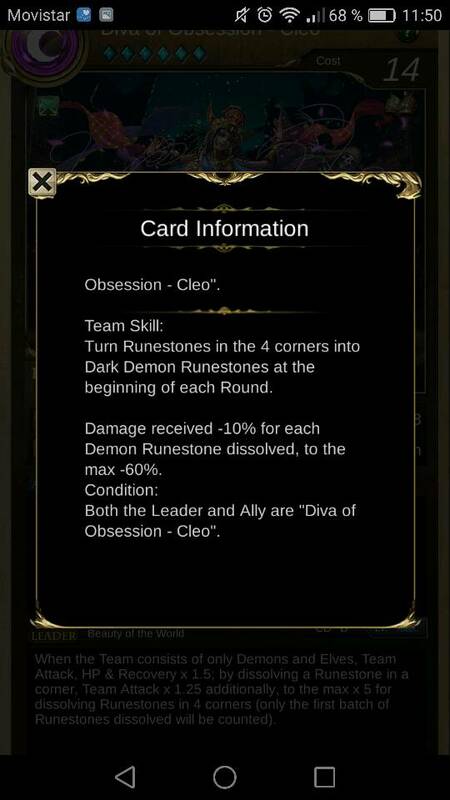 Spinning hazards aren't too bad because of Cleo's active skill. Will add more this weekend. + 27k HP Average for a demon mix elf team (average team HP is around 12k in my books), damage reduction is quite nice especially if you want to tank enemies. - Team Skill pushes for Dark Demon / Elves (mainly dark demon due to convert skills). Using other attribute demons are NOT recommended because they don't benefit from convert effect. - Below standard average damage. - Conditional multiplier is really hard to achieve, even for experienced players. You technically can focus on dissolving the corners, but that would reduce time to freely arrange runes and make combos. Maybe if it was released about a year back it would have some relevance in the meta. I count the 60% shield as ashtrays active because the team skill converts fire light and dark runes you touch when moving info enchanted demon runes if their attribute so it's easy to get six demon runes even without the converted corner runes. (03-29-2019, 03:02 AM)Joaqs Wrote: I count the 60% shield as ashtrays active because the team skill converts fire light and dark runes you touch when moving info enchanted demon runes if their attribute so it's easy to get six demon runes even without the converted corner runes. Forgot about this mechanic :pain:. Removed it from my comment. considering you can splash Light and Fire demons, such as Yogsothoth , Ghroth and Ygolonac, it is OK ba. Note that with 2 corners dissolved the multiplier is only 14x , with 3 dissolved it goes up to 31x and with 4 dissolved it is 56x , it's quite a stretch to ensure that you hit all 4 corners every round.